How to get there: From east or west, the main Hwy. E-134 will get you into the area. From the east, drive 11 km after Seljord to the intersection at Brunkeberg. 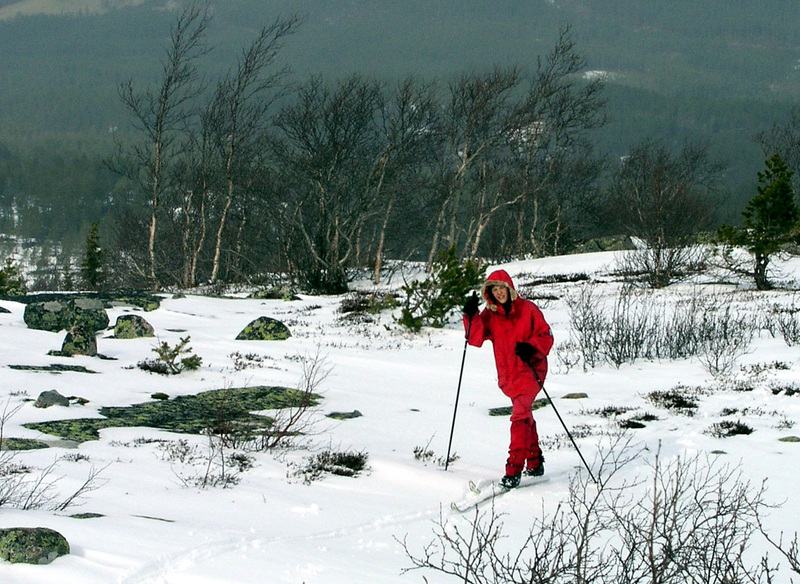 From the west, this is about 3 km after Morgedal. Measure from here. Drive Hwy 41 south to Kvitseid and continue up the hill across to the northern end of lake Nisser. Turn right and leave Hwy 41 after 17 km, continue along Hwy 38. Drive along the north shore of lake Vråvatn. Shortly after leaving the lake, at 38.9 km, make a left towards Fyresdal on Hwy. 365. At km 43.9, in Hauggrend, make a left. There is a sign here saying Roan. At 44.4 km, stay right, continue through a farm and find a (hopefully!) open gate at km 45.4. Pass through the gate and make a left where the road forks. Note that the sign for Roan points right at this intersection. Ignore this and continue uphill. Approximately 600 meter after the gate, make a right turn and continue along this road to km 47.8. There is space for parking here, do not block the road. There is a sign describing the trail and slightly further along, a sign that points right towards Roan, the trail descending to the nearby river. This is the trailhead, location north 59:18.519, east 008:11.374, at elevation 616 meter. This road may not be open in winter, if this is the case, then just park further down and continue on ski along the road to the trailhead described here. Route description: The trail leaves the road and crosses the small river that runs parallel to the road. The trail is quite visible and well marked with blue paint on the trees, higher up with cairns showing the way. The trail pretty much follows the ridge, just below 1000 meter, the ridge has a somewhat steeper section that is easily negotiated on the left side. If you follow the high ridge, then the very last part just before the "false" summit is rather steep. In winter, the trail is not easy to see in this area. We went straight up leaving the skis behind. There is a small cairn at this point, location is north 59:17.382, east 008:12.063. The main summit is further ahead somewhat south-east. There is a gentle 40 meter descent to the very broad saddle, then an even more gradual uphill to the very impressive cairn on Roan. Comments: I did this climb with my son Pål Jørgen. We started hiking at 0930, hit the summit at 1145. We started back down at 1215 and arrived at the car at 1300. 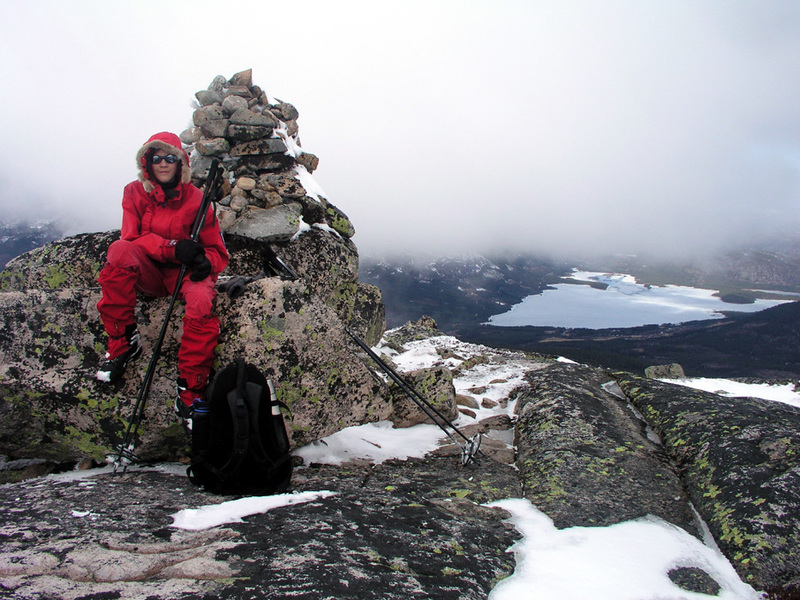 The first summit we came directly up to, is 1188 meter, with a primary factor of 40 meter to the 3 meter higher Roan. By chance, we arrived at the "false summit" when the rest of the mountain was wrapped in fog and my GPS initially gave an elevation of 1191 meter, precisely the height of Roan. Under such circumstances one may easily be misled to believe that the correct summit has been reached. However, a quick check with map and compass revealed that this could not possibly be the true summit. 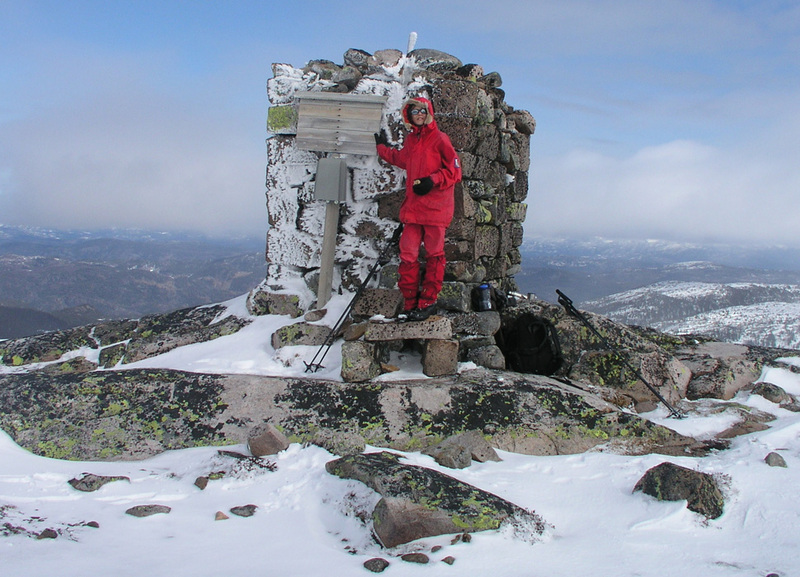 Pål Jørgen had announced before reaching the summit that we would indeed encounter a false summit first. These facts led us to search for the correct summit, fortunately, the weather cleared and we had sunshine on the top of Roan. 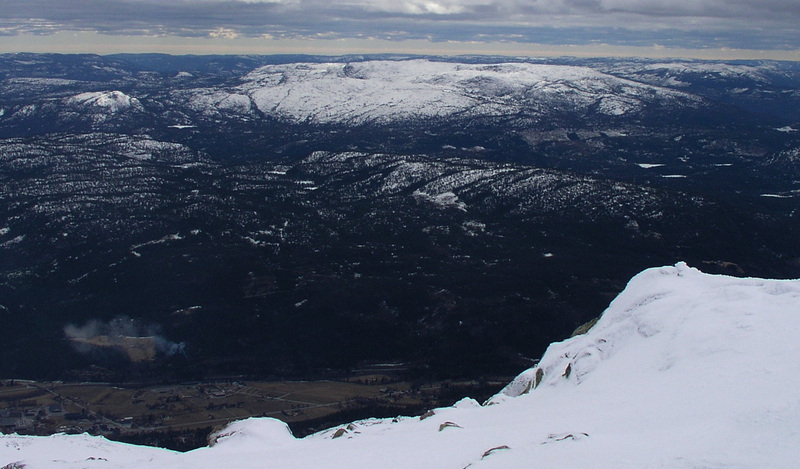 Roan, as seen from Gøysen (1370m). The summit is on the right side. Skiing on the way to Roan. Summit view, lake Skredvatn (336m) below. 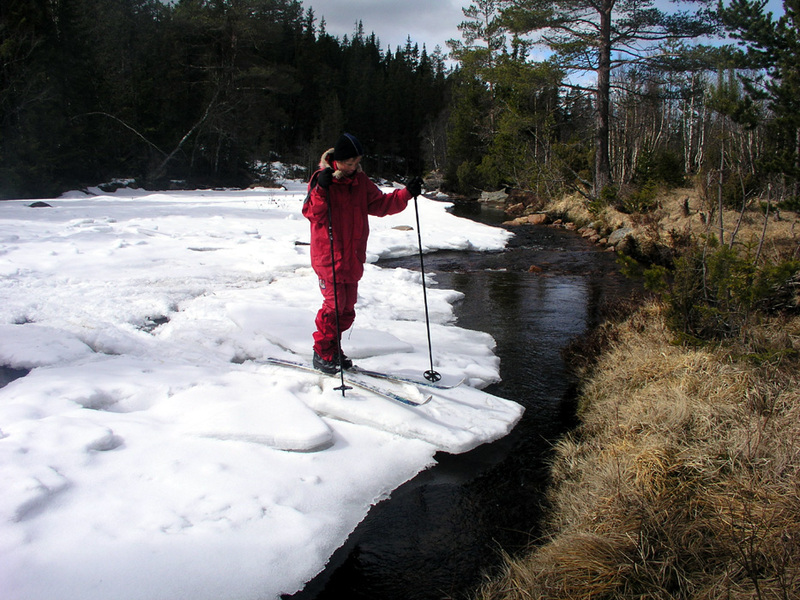 River crossing, with spring conditions, skis are very useful. The snow collapsed as he stepped across to dry land. 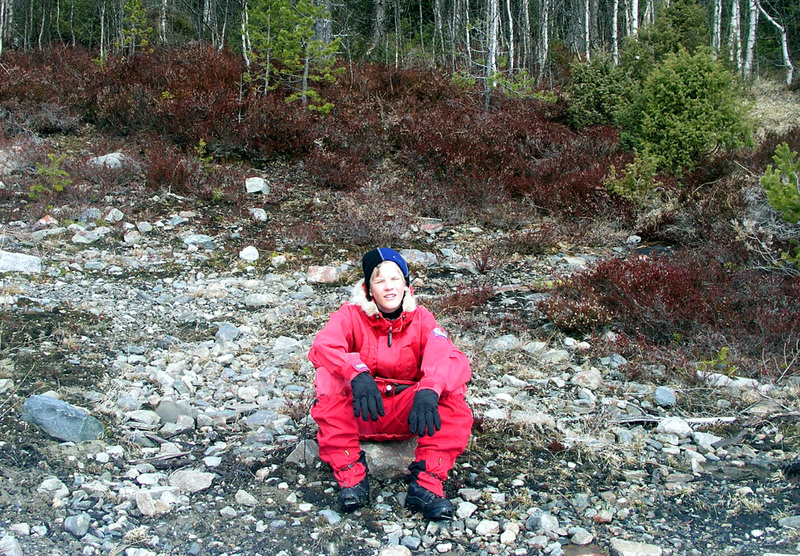 Back at the trailhead, Pål Jørgen takes a well deserved break.